Most people think of winter gardens in terms of zero—nothing happening, nothing growing. 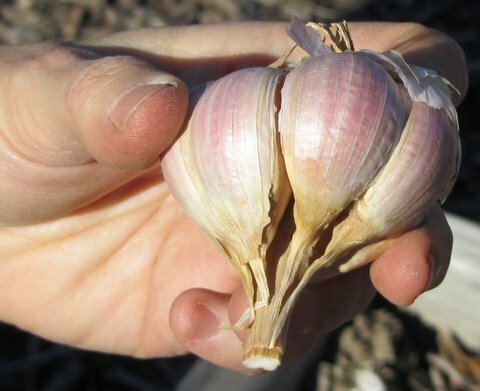 But Howard County Master Gardener Susan Levi-Goerlich knows that something will be growing in her garden this winter—garlic. 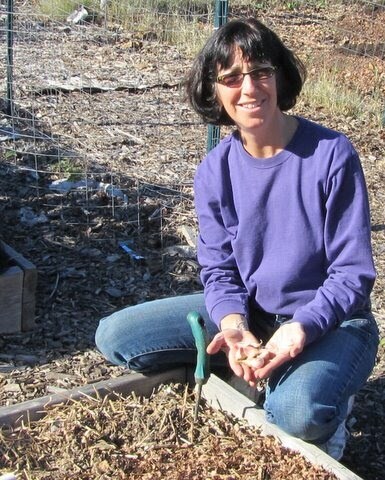 This year Susan has planted about 100 cloves, enough to fill a 4-foot by 8-foot raised bed at her plot in Westside Gardens, a part of Columbia Gardeners, Inc. The 100 cloves, of course, will grow into 100 heads of garlic, right? Susan expects to harvest her garlic next summer. “Traditional harvest date is Bastille Day, July 14, but I’ll begin checking in late June because some varieties mature earlier,” she said. I don't think I can recommend preserving garlic in white wine and refrigerating it (as I mentioned to Bob that I was doing when he interviewed me for this blog post). The garlic I “preserved” that way bubbles when I take the lid off the jar. Some kind of chemical reaction seems to be going on in there….and I'm not sure the garlic is safe to use.It may be headed for the trash can…..So sad. We'll take your advice and not preserve garlic in white wine in the fridge. I'll delete that reference from the posting. Thank you for the follow-through. Let's go with the old saying: Better safe than sorry.